OpenNebula 4.0 RC is Out for Testing! April 19th, 2013. OpenNebula 4.0 RC (3.9.90) is a feature-complete preview of the upcoming OpenNebula 4.0. This release fixes most of the bugs reported since the Beta release and brings some features that did not make in the Beta release, like for example more VM operations and the new Sunstone views to customize the GUI for different users or user groups, so the interface implements the provisioning model for each role. Sunstone views replaces the 3.x self-service portal. You have all the details in the OpenNebula 4.0 RC Release Notes. OpenNebula 4.0 includes new features, like a complete facelift of the web interface (Sunstone), NIC hotplug, VM action scheduling, VM snapshotting, more consistent action naming, outsider VMs tracking (wild and zombie VMs), new drivers for Ceph backends, and a myriad of bug fixes and minor enhancements. Although this release is considered stable, we are still fixing some bugs and it is aimed at testers and developers to try the new features. Your feedback is more than welcomed for the final release. https://opennebula.org/wp-content/uploads/2018/11/opennebula_cloud_logo_white_bg-4.png 0 0 Jaime Melis https://opennebula.org/wp-content/uploads/2018/11/opennebula_cloud_logo_white_bg-4.png Jaime Melis2013-04-19 16:56:222013-04-19 17:08:56OpenNebula 4.0 RC is Out for Testing! 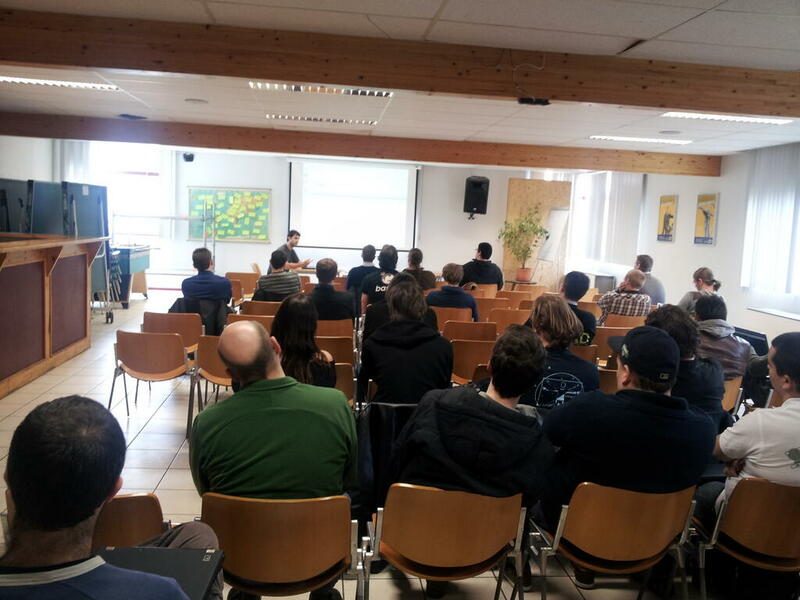 This past weekend Loadays took place in Antwerp, Belgium, followed by CentOS Dojo on Monday. OpenNebula participated in both events, giving a talk on OpenNebula Fundamentals, a 3 hour OpenNebula Tutorial, and a talk on KVM Optimizations using CentOS and OpenNebula. The whole experience of both events has been wonderful. The audience was involved, engaged, friendly, gave a wonderful amount of feedback, so, big thanks to you all for continously making OpenNebula a better product, for all those great conversations and for all the interest. We are very much looking forward to participate in future editions of Loadays and CentOS Dojo, and to possibly host a CentOS Dojo edition in the future! Special thanks to the organizers of both events: Kris Buytaert (@KrisBuytaert), Toshaan Bharvani (@toshywoshy), Karanbir Singh (@kbsingh) and the great guys of the venue, the Don Bosco school: Robert Keersse (@RobertKeersse). Oh, did we mention already that every speaker got a Raspberry Pi? NETWAYS GmbH has just announced its partnership with C12G Labs to provide services, consulting, and private- and hybrid-cloud-services based on OpenNebula. NETWAYS has been an active promoter of OpenNebula and a collaborator of C12G Labs since 2011 when they organized the first OpenNebula Workshop at OSDC 2011 in Nuremberg. NETWAYS and C12G shared an Exhibition Stand in the Open Source Park at CeBIT 2013. NETWAYS has been supporting companies to manage complex, multifaceted IT infrastructures for more than 15 years. Specializing in enterprise grade open source tools, they ensure the smooth operation of networks, servers and applications. NETWAYS has chosen OpenNebula for its implementation of standards, efficiency, availability, and scalability. NETWAYS has been successfully using OpenNebula in various production environments for several years. More information in the NETWAYS press release. Written in conjunction with scuttlemonkey (Patrick McGarry), of the Ceph Project, and cross-posted on the Ceph blog. scuttlemonkey: “The Ceph team has been extremely blessed with the number of new people who choose to become involved with our community in some way. Even more exciting are the sheer numbers of people committing code and integration work, and the folks from OpenNebula are a great example of this in action. It’s worth noting that the 4.0 release is still in beta and there was a bug discovered in the Ceph driver. Thankfully this has a workaround noted in the doc as well as a fix already committed for the release. If you have any issues feel free to stop by the #opennebula channel and let them know. OpenNebula continues with its growing support of new storage technologies. OpenNebula 4.0 comes with a fresh integration with Ceph, an impressive distributed object store and file system. OpenNebula provides an interface for Ceph RBDs (RADOS Block Device), which allows registering images directly in a Ceph pool, and running VMs using that backend. OpenNebula worker nodes should be part of a working Ceph cluster. The ”one” Ceph pool should be available (the name is configurable). Use Libvirt/KVM as the hypervisor. Xen is not yet supported. Once we have that up and running using it is extremely simple! scuttlemonkey: “Thanks to the OpenNebula team for hammering out this integration, we love to see new use cases for Ceph! While OpenNebula 4.0 Beta is already out in the wild, the OpenNebula team is working flat out fixing bugs and stabilizing the code to release the final 4.0 version (codename Eagle) as soon as possible. Feedback for the new Sunstone interface has been great so far, and the last touches are being given to the new self-service portal that would use the same foundation as Sunstone. Administrators and users would be able to log in into different views, accessing different functionality. An answer was also looked for the question Which Cloud Management Platform is the most open?, where arguments are given for the different perspectives (namely, developers and users) of the cloud actors. Also, we would like to remind you about the active Call for Translations for OpenNebula 4.0 Eagle, so if you are interested in translating Sunstone to your language, please take a look at this email. Another month, the community has been as involved and as active as ever. Cisco is contributing a prototype for NetApp filers to leverage its fast cloning capabilities. Cerit has created a VMM driver for managing truly High Availability OpenNebula KVM instances via RedHat’s “High Availability Add-On”. China Mobile is integrating a new storage system with OpenNebula in its Big Cloud Elastic Computing. This is interesting since they manage a large scale deployment, so their feedback on this is very valuable for the project and the software. We welcomed two new partners (NetWays and Inovex) in Germany that are providing value-added integration and consulting services around OpenNebula. These new partnerships underpin the confidence of these companies have in OpenNebula and C12G Labs. They have identified OpenNebula as the best available open source product for cloud applications after thorough and critical evaluation. The OpenNebula project will participate in two events that will take place the 6th-8th April in Antwerp, Belgium. The other event will be CentOS Dojo, taking place the 8th April. An event oriented at bringing together people from the CentOS Communities.